Between a rock and a hard place. Poor guy! I took this last winter at the Nevada Museum of Art in Reno. I’m also making this my Day 25 in the Project 365 arena. This entry was posted in 365, A Little Bit of the Everyday and tagged art, Nevada Museum of Art, Photo, photography, postaweek2011, Project 365, sculpture, weekly photo challenge, Wire/Rock sculpture. Bookmark the permalink. Thanks Cedric. That’s an incredible little museum. I have been there a time or two…between a rock and hard place. lol, I think I have too. I mean dramatic depth in art….not eat. It’s 6 a.m. and I’m craving for hearty breakfast. Stay blessed my friend. 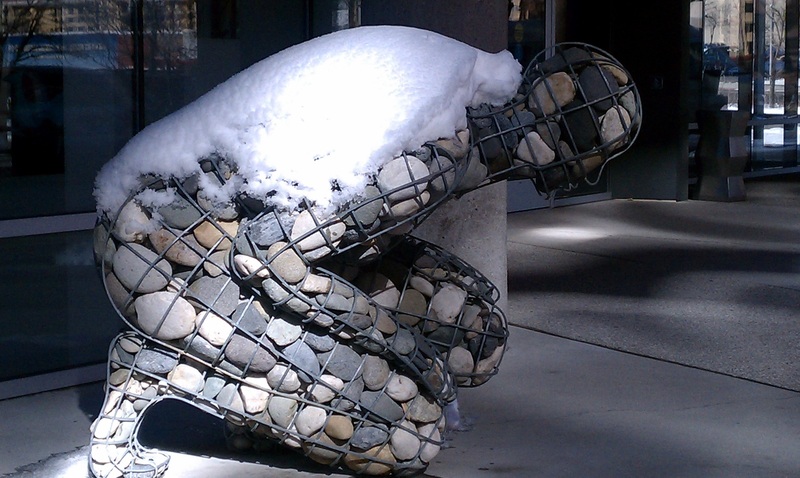 The sculpture by itself represents, to me, how we sometimes feel so weighted down with problems; but the addition of the blanket of snow and ice on top of that is really something to think about….. Thanks for the pingback Frizz! Thanks IT, for the pingback. Thanks Jake. Have a wonderful holiday. Awaiting Spring to break free 🙂 I wish 2012 offers you and your family health, peace and love. They will add the strength and harmony we all need. Thanks always for your visits and comments, and may you and your family also have a fantastic 2012. Thanks! Have a wonderful holiday weekend too! 🙂 I think you’re correct. Fantastic! I love it. He IS between a rock and a hard place! Thanks pegbur7. Reminds me of some kind of mythical penance. Thanks for the pingback e.
Thanks ElizOF…Glad you like it! Very nice entry. He looks a bit cold… Stone cold actually. Thanks CG, and very funny!